Opened in 1973, Quarry Hill has served as a nature education center for thousands of school-aged students and the Rochester community as a whole. One of the crown jewels of the City of Rochester's Park system, Quarry Hill Nature Center is seated in the 329-acre Quarry Hill Park. The park features 8+ miles of paved and hiking trails, a pond, and a historical sandstone cave carved in 1882 and in winter months, cross country skis and snowshoes are available for rent to use in the park. 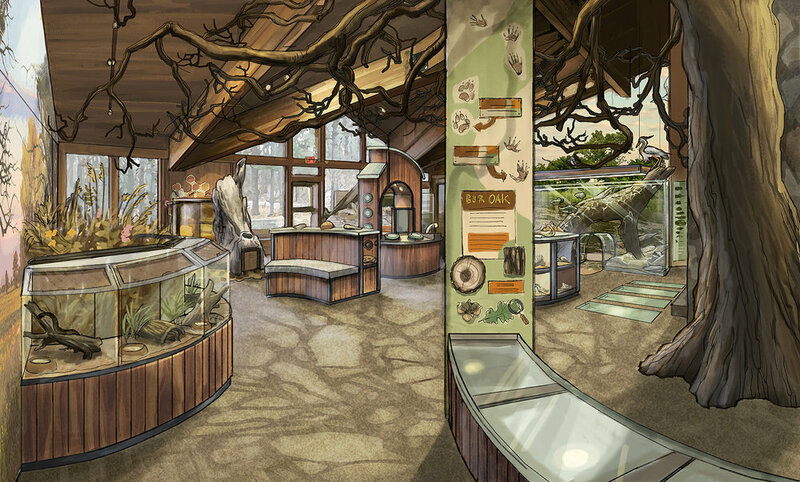 The nature center building houses live animals and an admission free Exploration Hall which has been a cherished, well-loved resource for the local community for more than 45 years. Beginning in 2012, Blue Rhino Studio partnered with Quarry Hill to help design, build and install the exhibits as part of their historic $2.6 million dollar renovation project. 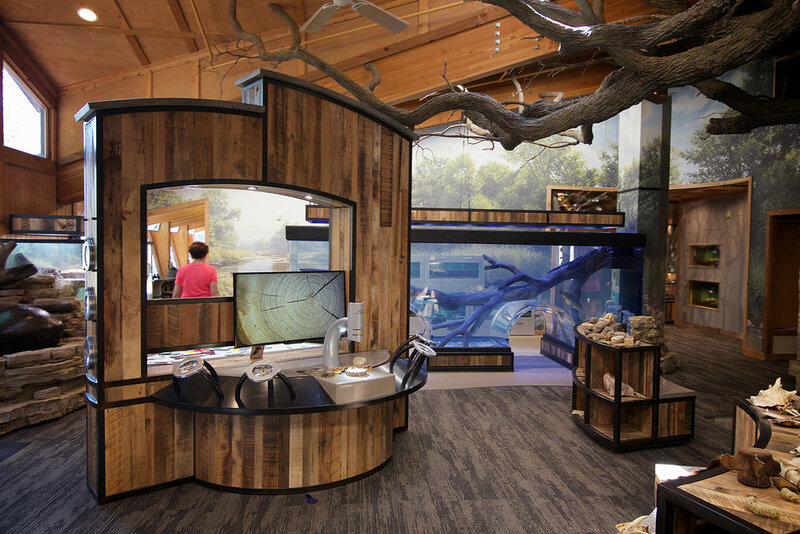 All aspects of the project were meticulously overseen by designers at Blue Rhino Studio, and the final renovation, which opened in April 2018, is a shining example of modern, accessible natural science education. Most of the exhibits are made from materials such as reclaimed wood and recycled steel. Lighting systems will run on energy-efficient light-emitting diodes, and special attention was paid to ensure the health and safety of the numerous live-animal habitats throughout the building. 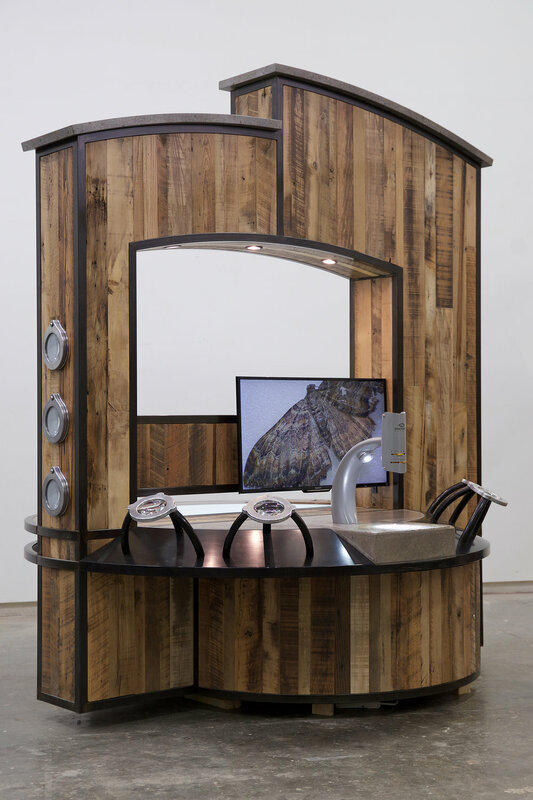 • A central “investigation station,” a child-sized table with magnifiers, including a MicroEye scope linked to a video screen, plus a light table and black-light box — all of these devices to aid in examining natural objects found inside or outside the nature center. • A life-size replica of a burr oak tree, as tall as the room with branches extending out across the ceiling, to display oaks’ function in the restored savanna grassland environment outside the nature center. • “Touch tables”, which can be arranged in different configurations around the space, even forming an “amphitheater” array in front of the original fireplace. 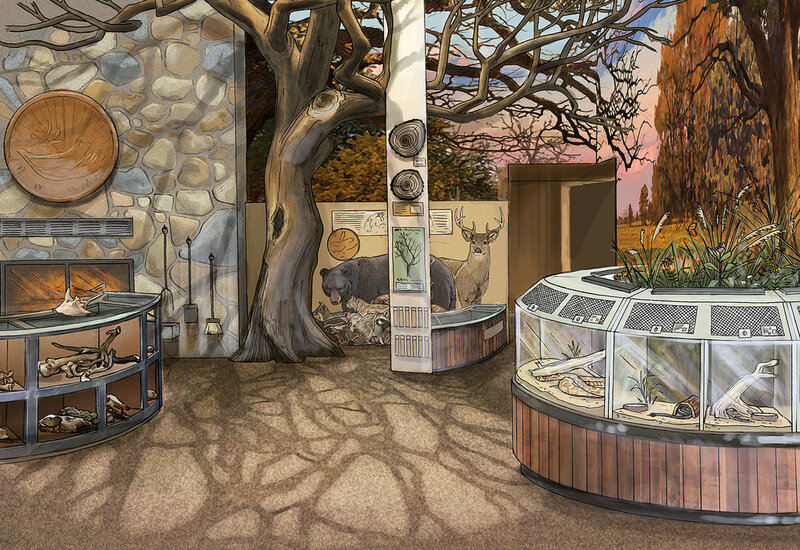 • An Ordovician fossil exhibit, disguised as a chunk of classic sedimentary rock, complete with embedded real fossil specimens and a background mural showing what life was like during the Ordovician period. • In-floor dioramas containing meticulously crafted miniature landscapes, habitats and natural processes. 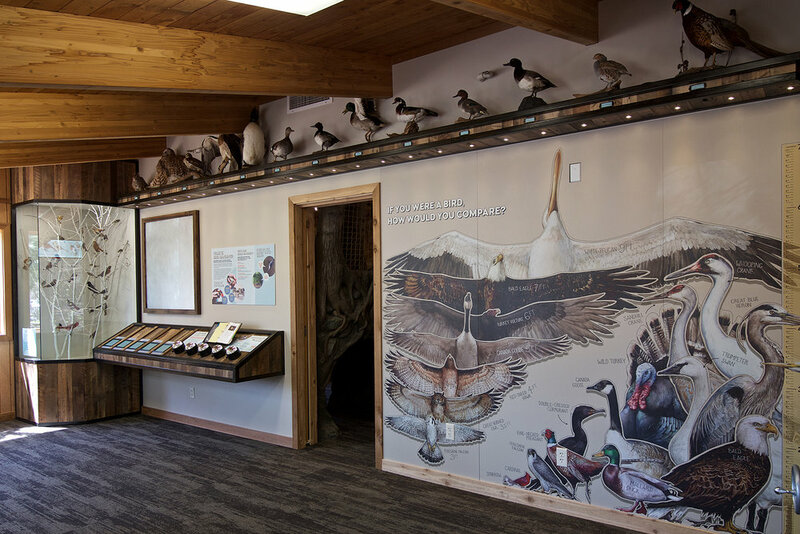 •Floor-to-ceiling murals, printed on durable, easy-to-clean vinyl wall-covering, and showing scenes from the local riparian and prairie habitats. • A giant freshwater fish tank, including crawl-through tunnels underneath. • Custom housing for living snakes and invertebrates, created in beautiful crystal-clear acrylic with specialized locking systems and easy-access lids.